LG's 2014 webOS TV interface leaked online | What Hi-Fi? 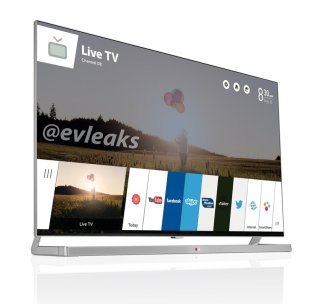 An image of LG's new webOS TV platform has been leaked online by notorious leaker evleaks. The platform, it is said, is due to be unveiled at CES 2014. An image on the Twitter account of @evleaks shows off what is rumoured to be LG's new webOS TV interface, apparently to be unveiled next week at CES 2014. Assuming the image is genuine, it seems LG has completely overhauled the current design. Instead of boxes that house different apps, all apps are now in one sleek line along the bottom, with the one currently in use made larger. The image also suggests that YouTube, Skype, Facebook and Twitter will be available from launch. The TV on which the interface is pictured appears to be almost bezel-free and has a wider, more angular stand than 2013 models. A camera has been placed at the bottom, rather than the more usual top, of the frame for motion-sense controls and video chat. Both the TV and webOS platform should be making an appearance next week in Las Vegas at CES 2014. We'll be bringing you more details as and when we get them.